Have you ever found yourself wondering what it really takes to look like a figure competitor/fitness model (or if it's possible to do so while fueling properly)? Well, we were able to track down the stunning Stephanie Lynn (some of you may recognize her from Bodybuilding.com or MyFitnessPal) who was willing to spare a minute of her busy time for the fam. Stephanie dishes on how she achieved her “fitness model” look without the standard, metabolism-trashing methods of excess cardio & insufficient calories. Hey Stephanie! Thanks so much for agreeing to this. We've heard that you just finished a show. Can you tell us how you placed? I placed 1st in my class (Open – tall class) and 3rd in the Figure Master's (over 35) division. Congrats! How long have you been competing now? What inspired you to start? This was my second year competing… my second show ever. I have ALWAYS been intrigued with bodybuilding. I started lifting weights back when I was in college. I met my husband at our local gym. We trained together when we were dating. He taught me about all the different exercises and how to put together a routine. His aunt (also named Stephanie) was a bodybuilding competitor. She was the first woman I had ever seen up close with that much muscle mass. I used to look at her with awe. I used to think, “I would LOVE to look like that one day.” Once I became a wife and mother I had all but given up that dream. Don't get me wrong…I was still working out. I was in the gym every day for many years but I seemed to see little progress. I eventually stopped making my fitness a priority and quit working out for about 8 months. It was the longest break I had taken from exercise in my whole adult life. In that time I gained some weight…and I was miserable. By the end of 2010 I reached a point where I no longer felt comfortable in my own skin. My face was round, my clothes were tight, and my self esteem was in the toilet. I had to make a change. I started training harder and pushing myself in the gym. I did get stronger but I didn't make as much progress as I would have liked. A year went by and still not much had changed. I had been killing myself in the gym and I still did not like my body. That's when I realized that while I had the training down, I had yet to conquer the diet. In January of 2011 I downloaded the My Fitness Pal app to start tracking my calories. That was the catalyst for my fitness revolution! Many women spend the better part of their lives dieting to achieve the fit, lean, muscular look that we see on fitness models and competitors like you. Can you explain to us the methods that you used to achieve the level of muscularity required for the stage? Or were you always lean/muscular? Was I always lean and muscular…LOL…NO! I am, by nature, long and lanky. If I would just diet and do cardio I would look like a stick woman. I am not at all genetically inclined to build muscle. I have learned that I both gain and lose fat fairly easily while building muscle has been more of a challenge. When I first learned how to count calories/macros, my first goal was to lose weight. I went from a “fat” 140lbs down to a super lean 120lbs. 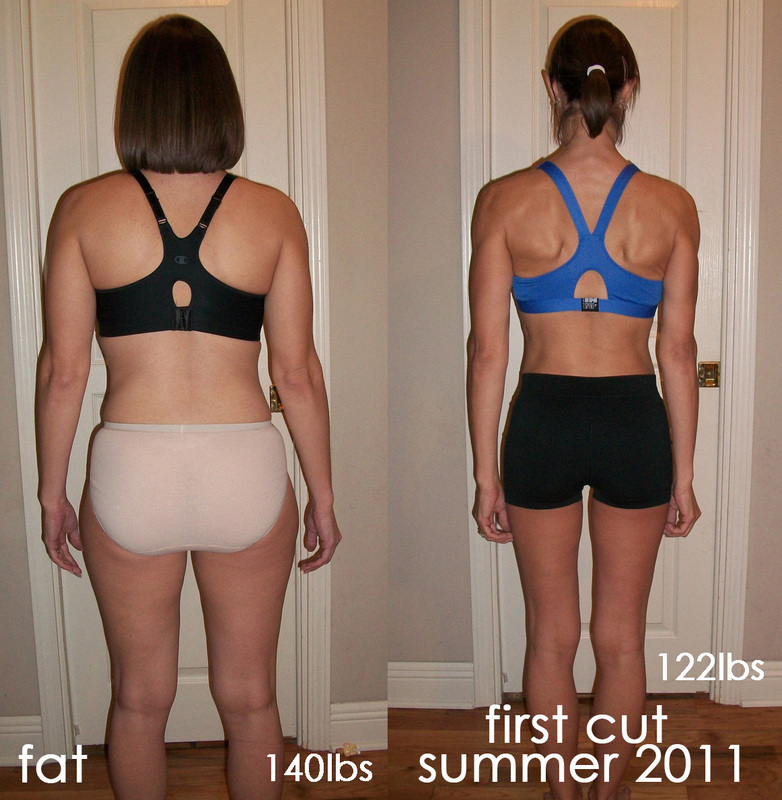 At one point I even got down to 117lbs, which is way too skinny for a woman of 5'7″. Remember I had been exercising for YEARS before this but yet my training lacked purpose and progression and my diet was a mess. I was pretty much eating whatever I wanted. I am living proof that you cannot out-train a bad diet! 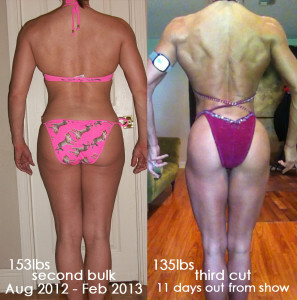 So, (we often recommend “bulking” for ladies who want to build muscle)…do you feel that it's possible for a woman seeking the “fitness model look” to achieve it without bulk cycles? ^^That is the biggest lesson I learned throughout this whole fitness experiment. Consider not just the change in my body, but the change in my weight. I weigh only 5lbs less in the last picture than I did in the first. The scale is just a number. I started my journey wanting that number to go down. Now I just want it to go up!! I am hoping by next summer I'll be ripped at 140lbs. That would mean coming full circle for me…back to my “fat” weight but with a completely different body! In addition to my weight, also note my waistline. My waist was around 26 inches at 120lbs. Now, at 135lbs it's 27.5 inches. It's bigger…but look how much smaller it appears to be. This is one of the amazing things about muscle. It balances out the body and gives you curves in the right places. I am more of an hour glass now than I ever was before. Building a wider back, bigger shoulders, and a bigger bum have actually made me look more feminine! Now, your cut was a bit different from many that we've seen (in the industry)– in that you didn't drastically slash your cals, or do cardio 3xs/day. Can you explain how you were able to achieve this same look without using these traditional methods? My diet is quite different from a lot of other competitors. I have been doing intermittent fasting for over a year and a half now. This method of eating allows me to consume more food at each meal including a late evening meal before bed to sustain me during the night. I usually start my cut 20 weeks away from the show with my calories close to maintenance (around 2000). From there I slowly cut calories down as needed to see progress. For this last cut I spent the majority of those weeks eating around 1800-1900 calories. I cut down closer to 1600-1700 in the 4 weeks before the show. I did the same with cardio. While bulking I was doing only a couple of Zumba classes per week just for fun. I slowly added cardio as well. I started with 20-25min at the beginning then worked my way up to 45-50min towards the end. Some days I'd do Zumba and some days I'd use the cardio equipment (either the stairmill or the high-inclined treadmill). I believe in a gradual approach to dieting. I prefer to lose on as much food as possible. You never want to play all of your cards at the beginning. 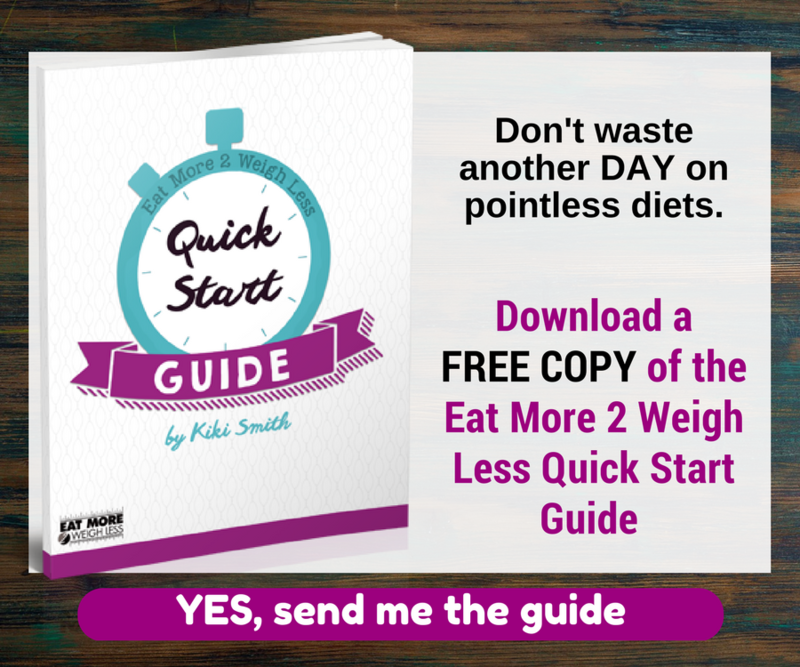 If you start too low with calories you will have nowhere to go if/when you plateau. If you are doing 1hr of cardio every day while you are bulking then you'll have to double that by the end of your cut. Remember that the body likes homeostasis and will adapt to whatever you are doing. You will have better and easier progress if you save some of those cards to play later in the game. Can you describe the difference in your scale weight between off season and competition day? What about changes to your diet/workouts? Well you can see in the images how my weight fluctuates. I will start my 3rd bulk next month and I predict I will likely get up to at least 155lbs. That's a 20lb gain. As for my diet, I will be eating a lot of the same foods just more volume with a few extra treats thrown in there more often. I fully intend to stuff my face for the holidays. As for my training, I change this up fairly often both during contest prep and in the off season. Once I lean down for a show I can see what muscle groups are lacking and pinpoint which areas I need “bring up” to foster more balance and cemetery in my figure. I will often increase the frequency in which I train these areas so they are getting hit more often…more stimulus and time under tension. I am generally stronger when bulking because of the extra food so I will take the opportunity to increase my strength and train in lower rep ranges. I lose some strength while cutting but I still try to keep “weight on the bar” so that I retain as much muscle mass as possible while eating at a deficit. I often make up for this by increasing my volume a bit (more sets and/or reps). So would you say that it's realistic for women to strive for a competition look all year long? No. It isn't realistic at all. I would never try to maintain this look year round. When you are cutting for a competition you are putting your body into a catabolic state. You will lose some muscle mass while cutting. The longer the cut and the more aggressive it is (low calories, lots of cardio), the more potential there is to lose the lean mass you've worked so hard to gain. The off season is where you make improvements. You aren't going to gain any appreciable amount of muscle while eating a calorie deficit so you NEED the time off from dieting to both add mass to your physique and to improve your metabolism. Increasing your calories gradually over time will make your metabolism more efficient. If you do it right you will likely be able to lose weight while eating more calories than you did last time you cut. I am eating more food and doing less cardio every time I diet down. In addition to improving both my lean mass and metabolism, bulking up also gives me a much-needed mental and physical break from the strict diet. I don't particularly like micromanaging every bite I put in my mouth. During the off season I can relax a bit and enjoy life. What would you say to the many women who want to look like a fitness cover model, and are eating 1200 cals and doing 2 hours of cardio/day to achieve it? I would tell them, first of all, that those fitness models are often in peak condition for those photoshoots and most likely do NOT walk around like that all year long. Their images are also airbrushed to perfection. Most of those amazing women you see on the covers of magazines have spent years in training to reach that level. You are only seeing the results and not the hard work invested. Second of all, starving and cardio-ing yourself to death is NOT the answer. I can assure you…that cover girl didn't get to where she is by doing that…and neither will you! Furthermore, sustaining a very low calorie diet (and/or excessive cardio) over a long period of time is not only a mental and physical stress on the body, it can actually cause damage to your metabolism. Remember that your body craves homeostasis. It will adapt itself to any activity that is practiced over time. If you are eating 1200 calories per day + 2 hours of cardio over a period of time, your body will start to see this as it's “norm.” In response to the stress you are putting on it, it will adjust your metabolism (lowering it) in order to conserve energy and resources. This is what you do NOT want to happen! If you want to have the shapely look of those fitness cover models, you are going to have to invest some time in building your body up…both your lean muscle and your metabolism! I have a blog on My Fitness Pal (which really needs to be updated) and I also keep a journal on bodybuilding.com. Thank you SO much for your time, Stephanie! We really look forward to hearing more from you in the future! Best of luck on next year's show! Cardio Exercise - Weaning from excess cardio? in the abs area. I weighted 100lbs. when I started and I did gain any weight. I followed the nutrition program it is broken down in portions. I believe with doing the portion I was getting enough calories. Can you give me any advise over all as far as the food is concern. I absolutely love your bulking pix!